We will be reading an abbreviated version (via Foreign Affairs) of the Calomiris and Haber book in Political Economy of Regulation course this term. They forward a theory on why some banking systems are stable and have few crises (Canada, Scottland), whilst others are more susceptible to shenanigans and hence are less stable (U.S., England). The Dixit book might be just what we are looking for in terms of a “textbook” for Econ 100, as the Very Short Introduction series is generally excellent. I have also been collecting links for the Piketty book for the better part of the last year and a half. I have read at least ten review pieces, and perhaps this summer I will sit down and slog through it. More to come on that one. Finally, I am starting up with John Lanchester, a name possibly more familiar to English majors than economists. Nonetheless, Lanchester seeks to use “plain language” to convey complicated economics and financial terms to the layman. More on that later. Next term’s Economics Department Community Read will feature Francis Spufford’s fascinating Red Plenty: Inudstry! Progress! Abundance! Inside the Fifties Soviet Dream. It is an idiosyncratic book that draws heavily on historical figures and events to characterize a period in the Soviet Union where central planners thought that central planning would actually work. Once in a great while, however, a book [of historical fiction] comes along whose truth is so powerful that even the literary critics and professors take notice. Francis Spufford’s Red Plenty: Industry! Progress! Abundance! Inside the Fifties Soviet Dream is such a book. It contains more “truth” about the Soviet project than an entire library of “serious” novels and dry-as-dust histories. If I had to recommend one book on the Soviet Union to someone who wanted to understand it, Red Plenty would be it. Read it. The group will meet on most Tuesdays during winter term from 11:10-12:15, and you can sign up with Professor Galambos or Professor Gerard. The reading should be an ideal complement for those taking Professor Galambos’ comparative economics systems course. If you have some time in the next 50 days before next term starts, you might even be able to get a head start. We do this every term, so you could pick up half a course over the course of a year. Continuing our string of posts about the EU, here is a remarkable but perhaps unsurprising fact: Since gaining its independence in 1829, Greece has defaulted on or rescheduled its external debt five times (1826, 1843, 1860, 1893, and 1932). Greece has been in default roughly half the time period since 1829. That is culled from the astonishing This Time is Different: Eight Centuries of Financial Folly from Carmen Reinhart and Ken Rogoff. I’m finally plowing through some of summer reading recommendations. This particular recommendation was from 2010. Ah, Winter Break is almost upon us, which means that it is almost time to get to my pile of books. I’m not sure what came over me, but I just went out and bought a whole bunch more that I can’t possibly get to. Roger E. Backhouse and Bradley W. Bateman Capitalist Revolutionary: John Maynard Keynes. I picked this one up after reading this New York Times piece where the authors argue that contemporary economists are lacking in the “worldly philosophers” department (see also the previous post). Douglas W. Allen The Institutional Revolution: Measurement and the Economic Emergence of the Modern World. A perfect little something for the New Institutionalist that has everything. Allen is an expert on transaction cost economics, co-author of some great work on agriculture contracts, and one of the funnier economists you are likely to ever meet. I will bet dollars to donuts that the book contains at least one example that you’ll be dropping at your next mixer (From the publisher: “Allen provides readers with a fascinating explanation of the critical roles played by seemingly bizarre institutions, from dueling to the purchase of one’s rank in the British Army”). It says available December 1, but I got my copy in the mail today. Eugene Fitzgerald, Andreas Wankerl, and Carl Schramm. Inside Real Innovation: How the Right Approach Can Move Ideas from R&D to Market – And Get the Economy Moving. Schramm is from Kauffman, one of our recent visitors to the innovation class touted this as a must read, and I hear rumors that this will rear its head in Econ 405 next term. A convincing trifecta! Michael Lewis Boomerang: Travels in the New Third World. If you read this blog semi-regularly, you’ve probably seen something about Lewis’ new compilation of economic disaster tourism writing. I was going to recommend this as an e-book, but it has an unusually awesome dust jacket. Great for the plane. Gretchen Morgenson and Joshua Rosner Reckless Endangerment: How Outsized Ambition, Greed, and Corruption Led to Economic Armageddon. This was on my wish list and I no longer remember who tipped me off to it. Looks great, if a bit thick. I have some course-related pieces that probably aren’t such fab holiday gift ideas, but I will get to them as I get to them. I finished up Michael Lewis‘s The Big Short and I think I found it worthwhile and poignant. It’s a character-driven piece that follows some of the players — as the title suggests — who shorted the housing market and went to the bank. To Lewis’s credit, he seems to do a pretty good job of explaining the crazy financial instruments created and deployed to bet against subprime mortgages. To my debit (? ), I still don’t understand what was going on with all of this. The core of Smithian economics, further, is not Max U. It is entry and exit, and is Smith’s distinctive contribution to social science… He was the first to ask what happens in the long run when people respond to desired opportunities. Smith for example argues in detail that wage-plus-conditions will equalize among occupations, in the long run, by entry and exit. At any rate they will equalize unless schemes such as the English Laws of Settlement, or excessive apprenticeships, intervene. Capital, too, will find its own level, and its returns will be thereby equalized, he said at length, unless imperial protections intervene. The essay is interesting throughout, and I certainly approve of her message on this point. This is one of McCloskey’s continuing projects. This one began with her work in the 1980s, and continues to be discussed today. The preface to the second edition, in fact, begins with a discussion of why more people didn’t read past chapter 3 in the first edition. Now that Commencement has passed, we can get on with our summers. For me, that means I can try to take a bite out of the big, tasty stack of books I have been accumulating over the past 9 months. Michael Lewis, The Big Short. Almost anything by Lewis is fun to read. I was plussed* by the series he did for Vanity Fair, and recommend those highly. Last year we read his classic, Moneyball. Peter Drucker, Innovation & Entrepreneurship. This summer’s Reading Group pick. Tim Harford, Adapt: Why Success Always Starts with Failure. Harford writes beautifully (well, for a guy on the economics beat) and his explanations are generally lucid, convincing, and theoretically sound. More on Harford here. Daniel Okrent, Last Call. Tyler Cowen calls this history of U.S. prohibition “a masterpiece.” I am interested in the causes and consequences of criminalization of drugs and alcohol, and I am guessing excerpts of this will end up on my political economy reading list. Perhaps a course on the subject? “When we pick up just about any newspaper, we read about people caught in ‘ethical dilemmas.’ But nine times out of ten, they are not dilemmas at all. They are conflicts between prudential gain and ethical action. They are issues of temptation.” (p. 38). Philip Mirowski, Science Mart: Privatizing American Science. This looks like a clear winner. A historian I sometimes fraternize with is excited about this one, and I hear that “Mirowski is a wild man.” Let’s hope so. Expect to see this in Econ 450. F.A. Hayek, The Road to Serfdom. Following the Schumpeter Roundtable and Discovering Kirzner, we are picking up Hayek this fall as our department reading pick. Jonathan Franzen, Freedom. Well, I am going to be on the beach for a week. *It’s possible that “plussed” isn’t a word. Perhaps it should be. This fall, Professor Galambos and I will be leading a group read of F.A. Hayek’s The Road to Serfdom. The course will be offered for one unit as DS 391 — On the Road with Hayek, and we will have a sign up and coordinate times at the beginning of fall term. I expect with this book we will probably meet eight of the ten weeks. If you are the type that lets one-unit courses slide, you might consider picking up the book and giving it a once over this summer in preparation for fall term. I suggest you get the edition edited by historian of economic thought, Bruce Caldwell. For those of you looking to kill an hour with a podcast, here’s Caldwell at EconTalk, talking about Hayek. UPDATE: You can get an add course sheet outside of our offices. The Undercover Economist, Tim Harford, is all over the internets these days. He has just come out with a new book, Adapt: Why Success Always Starts with Failure — a meme no doubt familiar to the Pursuit of Innovation crowd. Beginning Monday, you can hear an extended discussion about the book over at our favorite economics podcast, Econtalk. 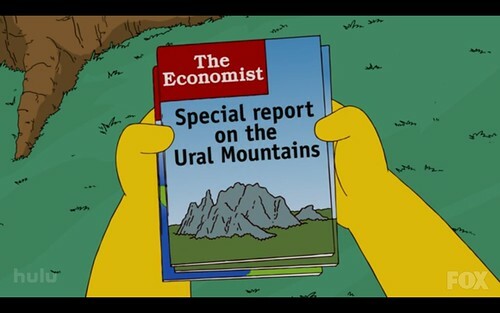 I have penciled this one in on my summer reading list. Harford also recently named his top five books that give unexpected lessons in economic principles, a list that included Klein & Bauman’s Cartoon Guide to Economics (my intro textbook! ), Charles Perrow’s classic, Normal Accidents, and Cory Doctorow’s For the Win, a book that should “appeal to any enthusiastic player of MMO [Massively Multiplayer Online] games.” Huh. Undercover. Unexpected. Un for the whole family. Looking to pick up some reading recommendations for the upcoming Reading Period? My pick is Tyler Cowen’s e-book, The Great Stagnation, which has been something of a sensation since its release (if by sensation you mean, which I do, a bunch of economists and policy wonks have been reading and reviewing it). Plenty of buzz about this one, and at $4, it is about the price of a magazine. Most of these are stocked over on the shelves of The Mudd (subject to availability, of course), along with a constant stream of tasty new releases. Just scanning that RSS feed, I see Michael Lewis’ breezy The Big Short as an appetizer(library info; more on Lewis here). And the fascinating-looking title Entrepreneurship, innovation, and the growth mechanism of the free-enterprise economies edited by Sheshimski, Strom, and Baumol could be a very enticing main course. I might just go run that one down. You might consider adding to that list Branko Milanovic’s new book, The Haves and the Have-Nots (discussed here), that I plan to order presently. For those of you who only do things for credit, there is a rumor floating around the department that as a follow up to the Schumpeter Roundtable, we will be Discovering Kirzner by reading Israel Kirzner’s Competition and Entreprenuership this Spring term. It was also recently announced that the Spring Lawrence community read will be Cheap: The High Cost of Discount Culture. Professor Galambos and I are both signed up for that one. Finally, I am right in the middle of Steven Johnson’s Where Good Ideas Come From, which my colleagues mostly seem to like. Something you can probably read in the car, if it wasn’t for the 6-point font footnotes. All right, who said it? I am not interested in literature, I do not go to the theatre, and I do not listen to music. I am occupied only with theories. Is that Professor Galamobos talking about what he did on his sabbatical leave? His advice to students taking Econ 300 during winter term? Professor Brandenberger talking about how LU professors used to be back in the day? Our new mantra for the Math-Econ major? It’s Nobel Prize winning physicist, Paul Dirac, describing the work ethic that led him to international superstardom, if only he would have desired such a thing. I picked up Graham Framelo’s biography of Dirac this past summer, and I would definitely recommend it as a good read for break, or a gift to that bookworm in the family. Continue reading The Strangest Man? It’s Talk Like a Pirate Day over at The Mudd, and elsewhere. Perhaps you should celebrate by reading Peter Leeson’s The Invisible Hook, an economic analysis of piratical organization. Or perhaps the JPE piece it was based on. Or even one of its many favorable reviews. The idea of the invisible hook is that pirates, though they’re criminals, are still driven by their self-interest. So they were driven to build systems of government and social structures that allowed them to better pursue their criminal ends. I read this over the summer and found it interesting that the classic pirates created reasonably democratic governance structures with built-in checks and balances, whereas most organized crime we think of today — including modern-day pirates, I’d guess — is more conventionally hierarchical. Is Gladwell’s Perspective on K-12 an Outlier? I just finished up Malcolm Gladwell’s Outliers: The Story of Success, with a rather unconventional take on the U.S. public schools. The girl he is discussing, Marita, is from a single-parent, low-income household. He is concluding a chapter on an experimental public school program in New York City, the Knowledge is Power Program (KIPP, for short). Marita doesn’t need a brand-new school with acres of playing field and gleaming facilities. She doesn’t need a laptop, a smaller class, a teacher with PhD, or a bigger apartment. She doesn’t need a higher IQ or a mind as quick as Chris Langan’s (a genius discussed earlier in the book). All those things would be nice, of course. But they miss the point. Marita just needed a chance. That is both a conclusion about our schooling, as well as a conclusion about how our society produces talent. Gladwell is the master storyteller, and in Outliers he writes convincingly how a combination of arbitrary advantages mixed with an extraordinary work ethic can compound to produce “outlier” talents ranging from Bill Gates to Canadian professional hockey players. My way or the Norway? Indeed, Gladwell is explicitly discounting exceptional talent as a significant factor in determining exceptional success. Instead, he contends that there is some threshold level at which incremental improvements don’t matter. So, there are many people who could have been Bill Gates, but Bill Gates was the only one with that level of ability that happened to fall into a situation that allowed him to become such a dominant captain of industry. I am certainly not qualified to discuss the literature on talent development, so I will leave it at that. My feeling is that Gladwell consistently conflates more mundane successes associated with someone like Marita with extraordinary successes of someone like Mario Lemuiex. This makes it both easier and more difficult to attack his argument. On the one hand, I completely buy the argument that most successful people are a product of chance and of hard work — there are few truly self-made men. On the other hand, it’s hard to believe that truly great scientists and mathematicians aren’t blessed with a skill set far beyond the domain of the 95th-percentile student. 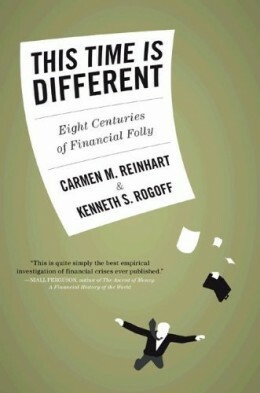 For today’s recommended reading, The New York Times profiles Carmen Reinhart and Kenneth Rogoff, authors of This Time Is Different: Eight Centuries of Financial Folly. You may recall this title from our summer reading recommendations that we posted a few weeks ago. You can find a paper approximation of the book here and a summary of its principal findings here. Both of these economists seem to be pretty interesting characters and the article is a fun read. I’m sure that I am not the only member of the I&E Reading Group plodding through Thomas McCraw’s enthralling Prophet of Innovation this week. I will also start in on the “live blog,” as promised. The book is a linear progression through both his life and his thinking about economics. One of the clear messages, and, indeed, a clear message of virtually any history of thought book, is that the thinker is shaped by his or her environment (see, for example, The Worldly Philosophers and New Ideas from Dead Economists). McCraw certainly paints Schumpeter (a.k.a., Jozsi, Schum, Schumy, Schump, Go-Go) as a product of his environment. From his mother’s social climbing (Chapter 2 Summary: Jozsi was something of a mama’s boy) to the horror and devastation of World War I to his spectacular failure as an investment banker, each of these experiences is linked to Schumpeter’s intellectual and professional trajectories. McCraw divides this world up into three parts: L’Enfant Terrible, The Adult, and The Sage. By the time he’s 40, he’s already “played many parts — boy genius, Austrian aristocrat, English gentleman, Cairo attorney, Viennese economist, university professor, minister of finance, investment banker, socialite, and free-spirited Casanova” (124). Not to mention, triumphant swordsman in a duel with an uncooperative librarian (I’m looking at you, Mr. Gilbert). That’s quite a whirlwind. Not incidentally, he had also written some defining pieces, including The Theory of Economic Development and “The Crisis of the Tax State,” which made him almost world famous. So, this week and next, I will be “live blogging” the book. Rather than recounting the fascinating details of Schumpeter’s life in the “live” blog, I am simply going to offer up some thoughts and topics for discussion that I have carved out and that other members of the group have provided me. I will likely have my first post up later tonight. You can get a listing of our progress by clicking on the tag “live blog” below. I hope it’s helpful.